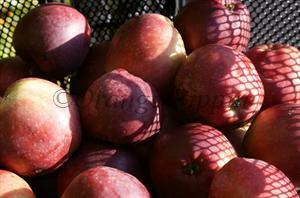 Spartan is a deep marroon-coloured apple with an excellent refreshing sweet flavour. Apple text books often describe the flavour as "vinous" and it can indeed have a wine-like quality, although this is first and foremost a crisp sweet juicy unpretentious apple. That flavour, and the crimson skin, are an easy clue that Spartan is related to the famous Canadian McIntosh apple. Spartan is undoubtedly one of the best of the many varieties which trace their ancestry back to McIntosh. It is also one of the few that have made it across the Atlantic to the UK, where it is widely grown and well-suited to the temperate UK climate. Spartan ripens quite late in the season, usually around early October. The apples will remain on the tree over a 2-3 week period, which means you can pick a few at a time rather than have to deal with a glut. This is also the best way to enjoy them because although they keep fairly well, the flavour and crispness fade in storage. Spartan is also a very good pollinator of other apples, producing large quantities of compatible pollen. Spartan is a simple unpretentious apple, and when eaten straight from the tree on a crisp cold morning is a real delight. Please fill in the details below and we will let you know when Spartan apple trees are back in stock. Spartan is in flowering group 3. Spartan is partially self-fertile, but fruiting will be improved if there is a compatible tree of a different variety nearby. Since it flowers in the middle of the blossom season it can be pollinated by most other apple trees. Although it originates from Canada, Spartan has long been a favourite in the cool temperate climate of England, and as might be expected from a Canadian variety, it is naturally cold-hardy. Whilst it will grow throughout the UK, it is generally happier in areas with drier climates. It crops reliably and heavily. The fruit tends to be small but moderate thinning is very effective and the remaining apples will be a good medium/large size. There are few disease problems, and birds and aphids are not often an issue either. It appears to be somewhat susceptible to scab in areas with damp climates, but unaffected in areas with dry climates. Spartan also tends to produce a neat and attractive tree. The large quantity of blossom makes it a good pollinator for other apple varieties. The pollen is also viable at lower temperatures (10C rather than 15C-20C) than most other apple varieties, making it a useful variety to grow if your orchard is in an area with cold spring weather. 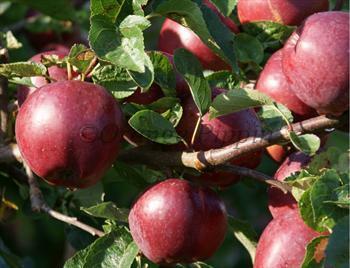 Spartan is one of the most widely-grown of the McIntosh family of apples, which are characterised by their deep maroon skinand bright white flesh. Spartan was developed at the Canadian Apple Research Station in Summerland, British Columbia, in the 1920s. The female parent is McIntosh, and the male parent is thought to be the popular American variety Newtown Pippin although this is not certain.